Neal Cox, associate professor in Stephen F. Austin State University's School of Art, supervises as Sydney Wemple, senior English major from New Caney, Texas, makes her first print at the Maker Fair. Students engaged in multiple activities, including a virtual reality demonstration, 3-D printing, making butter and more. NACOGDOCHES, Texas - Wires, red plastic cups, magnets and other gadgets blanket the table as eager students await instructions. Dr. Hector Ochoa, assistant professor in Stephen F. Austin State University's Department of Physics, Engineering and Astronomy, explains how students can use the household items on the table to create a speaker. Soon, students begin constructing their own devices. This activity was part of the SFA School of Honors' Maker Fair, an event that introduced students to various disciplines through hands-on activities. "I really enjoyed showing students that engineering is not as complex as we think," Ochoa said. "You can use household items to create things that we take for granted, like a speaker." 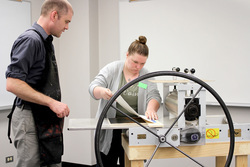 Across the room, more students roll up their sleeves and begin to learn printmaking from Neal Cox, associate professor in the School of Art. After learning the proper way to ink a roller, students take turns running the press to print their own image of a tree. "The goal of the Maker Fair was to provide an opportunity for honors students to interact with each other and with faculty members from across campus while also introducing them to different subjects," said Dr. Megan Condis, assistant professor in the Department of English and Creative Writing. The Maker Fair featured activities from four of SFA's six colleges. Students first visited the Emerging Technologies Lab in Steen Library to participate in a virtual reality demonstration and learn about 3-D printing. "The overall experience was amazing, and I had fun during each section," said Jamie Morreale, junior interdisciplinary studies major pursing certification in early childhood through sixth grade education. "I loved learning new things, such as coding, making butter, virtual reality and 3-D printing. I would go to another Maker Fair." Sara De la Garza, Nacogdoches junior interdisciplinary studies major, also said she enjoyed the event and added that it informed her of all the resources available at SFA. De la Garza intends to become certified as a teacher of students in early childhood through sixth grade. Students learned to code for an hour with Elizabeth Hutchison, lecturer and interim assistant to the chair of the Department of Computer Science. Additional activities included learning how to make butter and LED bracelets. "The Maker Fair taught me creativity is more than just painting or writing; it's a range of activities," said Emily Crider, Arlington junior studying English and secondary education. "Any passion or hobby becomes creative the minute you add your own ideas or emotions. As college students, we're so often inundated with grades and GPAs that we sometimes forget to just have fun. In the end, that's what creativity is - having a good time doing what you love in your own individual way." Organizers are planning to host additional Maker Fairs in the future. 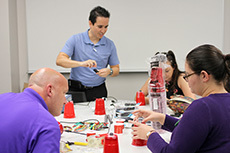 Dr. Hector Ochoa, assistant professor in Stephen F. Austin State University's Department of Physics, Engineering and Astronomy, explains how to use household items to create a speaker during the School of Honors' Maker Fair. The fair was designed to introduce students to various disciplines through hands-on activities.